Vision | The Follow Me Foundation, Inc.
On the way home from the Follow Me Foundation one evening, Jesus appeared to me in a vision. I can’t explain how I continued driving, but I can explain what I saw. 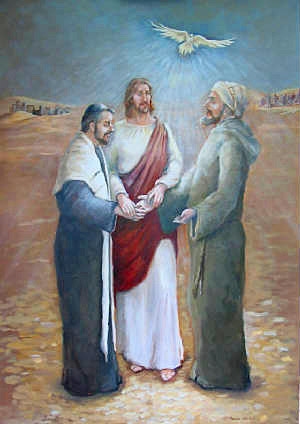 Jesus was standing between a Jewish man in traditional clothing and a Muslim man also in traditional garb. Jesus was taking each of their hands and joining them together. The men didn’t look especially thrilled. When their hands were joined together Jesus’ eyes looked up and I saw the Holy Spirit in the form of a dove, showering the men in an incredible light. The background was somewhere in the Middle East. Jesus told me to remember this image and to have someone paint it. He then said, “when completed, have two prints made and signed by the artist and both numbered 1”. The prints are to be presented to a representative from Israel and Palestine or another predominately Muslim country. This was to take place at the United Nations. I asked Jesus what it was to be called, He said, “my peace I give to you”. Needless to say, I was overwhelmed. Immediately I sought out various artists since I knew he wasn’t asking me to paint it personally. Thank goodness, I’m a horrible artist. The different artists I came upon wanted a great deal of money to create the image. We are an organization that caters to the poor, so that was out of the question. In December of 2003, I went on a pilgrimage to Medjugorie in Bosnia with a number of friends including Fran Gillen. The trip was filled with incredible miracles! I explained the vision to Fran and she said she would like to try painting it. By mid-February 2004, I had in my hand a sketch of the vision on brown paper. It was exactly what I had seen. When I expressed what an awesome likeness it was Fran immediately began painting. What you see is the vision Jesus showed me, recreated in the most beautiful painting. Our prayer is that you are inspired by the peace, beauty and love that this picture expresses.